Because opening a shampoo bottle is so. much .work., I pour shampoo, conditioner, and body wash into a shampoo dispenser like this one. Two pumps are more than enough to wash and makes a bottle a little longer than on its own. What to do? 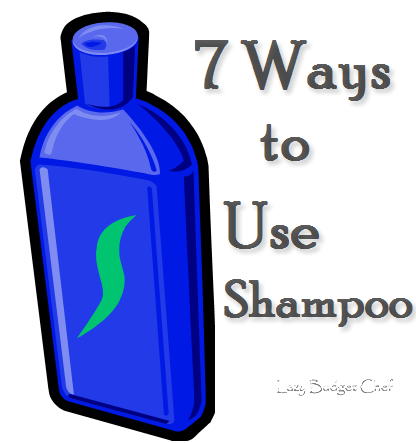 I researched, experimented and found seven ways to reuse old shampoo. To wash delicates. I always used shampoo to hand wash nylons and lingerie that’s too delicate for the washing machine. For cleaning. Use it to scrub the tub, shower, or toilet. Add some baking soda to it if you need a little more oomph to tackle a bathtub ring. As a laundry stain fighter. Shampoos are designed to remove the oil and dirt from your hair and are the perfect stain fighter, especially perspiration or ring around the collar stains. Pour a little on the stain and scrub with an old toothbrush before popping it in the wash.
To wash makeup brushes. Especially if they are brushes made with natural bristles. To wash wool. Shampoo works just as well or better than Woolite when hand washing wool sweaters. To wash combs and brushes. Soaking combs and brushes in a mixture of water and shampoo removes built up product. Be sure to rinse the items thoroughly when finished. To make daily shower cleaner spray. I mix equal parts vinegar and water with a sploosh of shampoo in a spray bottle, spray it on the walls, and shower door after every we use. It keeps mold, mildew and soap scum from building up until it is time to clean the bathroom. It makes deep cleaning the bathtub much easier too. Get the recipe details here. Warming: Do NOT use people shampoo on dogs or cats. The ph of pet skin and fur is different from humans. Human shampoo strips their fur of their essential oils and can dry out pet skin. If you have any questions please check with your vet. 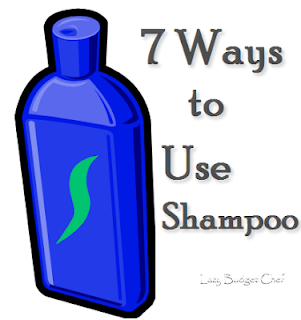 Do you have any ways to use leftover shampoo? I use it for cleaning as well as washing delicates! I will have to try the other uses - thank you! Hope you can stop by the enchanted oven. I have never thought to use shampoo for other things! Sometimes I can even get good deals with a coupon, but it isn't my brand so I pass it up. Not anymore. We are starting a link up party on Thursdays (today:), and we would love for you to join us with this post and/or any others you would like to include. We are at allthingswithpurpose.com. Hope to see you there!! Great tips! Thank you for linking up at Fluster's Creative Muster. Never heard of using shampoo to wash makeup brushes before. I'll have to try it. Thanks for the tip.